I read so many pleas for help in the Breed Groups and other local dog forums I belong to. They are responded to with well-meaning but often outdated, amateur advice, which often could be emotionally harmful for the puppy but particularly dangerous if there are children involved, which there often are. I will not discuss those methods as the positive ones below will ensure there is no need to scare or be unkind to your puppy. Puppy nipping is a normal part of puppy development and all puppies go through this stage, some more so than others. It is a way of communicating, albeit in an unsophisticated way. We find it hard to read what they are telling us subtly and so they ramp up to a full on message giving. I fostered (I failed, she stayed ) my Lola as a result of being a particularly bad Pirhana puppy, I know exactly how it feels to have your fun, much loved, adorable puppy become some manic horrible growly being. It is horrible, isn’t it? How do we provide pain relief? Some great ideas are : supervised frozen carrots or other dog appropriate veg or fruit , frozen rope toys, frozen kongs or ice lollies. Try getting a sock wet it and freeze it, or use a tea towel or flannel… all these things can be swapped for what they find easily available …YOU! LOTS of calm; a chance to chill out. Being over tired and over stimulated is the other reason for what seems like total “manic” behaviour. Like young children without proper sleep and a calm environment for rest time puppy brains become overloaded and they get “cranky”. Puppies need around 18-20 hours a day of sleep and calmness. This is imperative to empty out the build up of hormones from the excitement of having fun, and exploring their world, but also to digest their food, and process their learning. Without the rest time, learning can be inhibited and a puppy can seem to be “hard to train” or “wilful”, but mostly they are overtired and need some time to rest. In a busy or noisy household this is difficult for them to achieve, they need us to guide them. There is a great blog on achieving calm here https://peacefulpawstherapy.com/blog . Following these guidelines will significantly impact on the intensity of the biting phase. This is a really good time to learn the best way to manage a dog who is pestering or has bad manners or seems aggressive (puppies are NOT being aggressive, wilful or dominant!) a good trainer with up to date puppy knowledge is really helpful as a specialist puppy classes. All attention is good for puppies, good or bad repercussions, they have achieved being noticed! They want to be noticed and entertained. Unfortunately their idea of entertainment is not in line with human expectations! Any attention is good attention for a dog, touch, eye contact and especially verbal responses, they have no idea what we are saying so they tune in to work it out (more attention giving!) Being still, silent and no eye contact is boring for them, removing the attention removes the response. NOTE they will get worse before it improves , testing to get the attention before they get fed up and leave to do something else or are distracted for another wanted behaviour. So ANY noise “ouch” , “squeals” , “shouting” , “shaking limbs” is all attention and worse raises the excitement and sense of fun, and ultimately is a positive thing for them, turning their misery into great fun, remember that fun raises happy hormones and makes them feel great! So be still and silent, wait for the pup to give up and begin a behaviour you DO want: a toy, some low energy play or a legal chew or just sitting wondering what next, THEN give attention. Another person could offer a distraction with a “legal” toy or quiet and still game or calm chew. If you have a really, really persistent pup, like I did with Lola, and when she is in pain she returns to this behaviour, and if small children, who are difficult to get to be still and silent, or be consistent cant keep to the no attention (this is what happened with Lola) then the following is my “go to” last resort . Get a “houseline” from a pet shop or amazon , it is a thin long line. Only ever use this supervised and it must be very careful managed (and obviously with children, the puppy and children are never together unsupervised). – Attach the line to the collar. – When the puppy begins the biting behaviour just pick up the line gently, with no words or attention and walk out of the room. – Lead pup to the quiet safe place that is theirs and they are not disturbed by kids easily … not necessarily their bed. – Give a pain reliever … and praise them calm and very quietly for engaging with it, they may only be there nanoseconds. It takes a while and commitment and patience to teach this self calming behaviour. – When they choose to get out of the safe place and return to the family time that is fine , we lead them there but they choose when they are ready to be back with us. THIS IS NOT A PUNISHMENT ! it should be a pleasurable alternative to choose, done with patience and kindness, B+NEVER use a safe place as a punishment. Every time the behaviour begins again, lead back and offer a legal chew, supervised if possible but no engagement . It may take 5 or 10 repetitions at the worst times this is usually when everyone is home and running around or playing or chatting and again in the evening. But being consistent can have a pup calmer faster. CALM, CALM and more CALM! Persistent “mad” pups are usually not getting enough sleep and general rest. Pups need at least 20 hours each day until around 8months – 1 year old as they are growing so fast . If your pup is not getting this, then you need to provide more nap, or rest times, we often need to proactively manage this . Teaching a dog calm behaviours in a place that is theirs is one of the most important things we can teach them. This blog explains in detail how to achieve calm and why it is vital. https://peacefulpawstherapy.com/blog . Sometimes pups become over excited and bitey because they are understimulated. Or over stimulated in a way that is too exciting. In recent years there has been a blossoming of ways to enrich, engage and also promote learning as well as tire out all dogs. Snuffle mats are popular with our crew, easily made with a fluffy bath mat with a scattering or yummy crumbly food like tuna cake or crushed doggy treats or grated cheese. We also love to recycle recycling !! Save those amazon boxes, packaging paper and bubble wrap milk bottles, little boxes, and put them all together, throw in a handful of kibble from their dinner or a little bit of roast chicken or sausage , get a cuppa and leave them to it ! Scent games such as hiding bits of food around are much loved. There are lots of focussed scent games around on the internet now. A Kong with different textures and tastes each time is a great resource as well as the tasting plates many new training methods include, a chance to have bite sized pieces of new foods. A great training school is a fabulous resource, especially one which is modern games based with enrichment and confidence building focus, alongside the usual manners learning. Some trainers now offer a pre vaccination visit to prepare for puppy classes meeting the specific needs of your family. Some time spent learning fun games and tricks (remember the happy hormones?) and practicing manners such as recall and walk manners can be worth a good hour of physical time and is deeply relaxing and tiring. A routine for play, rest, food , toilet and sleep is really important , this will help all the little niggles with settling a puppy! MOSTLY – HAVE FUN ! Why do some dogs feel firework fear? For some the noise and also the concussivness of modern fireworks is scary, initiating a biological fear response. This can happen any time with any dog, even if they have been ok before. The “ noise” can physically cause discomfort as the dog is sensitive to the air waves, the ground conclusiveness as well as the sound . Dogs hear 4x the distance we do. They pick up higher frequencies than us and the pitch can be excruciating. They are erratic and unpredictable, both within a specific display and between displays ( which now happen from October to January . They seem to stop and then start up .. often louder or a different sound . it is the unpredictability which is so scary. Dogs who are easily sound spooked are more likely to become firework fearful. Managed Exposure and a programme can help young dogs and puppies manage the range of novel sound better. The more confident the dog is in the first exposure or in subsequent ones the more “bombroof” they will be. This is true of subsequent events, the happier the dog is the easier they will cope. Dogs who are generally anxious or fearful will cope less well with novel sounds. Dogs with any pain or who are unwell will cope less well . The emotional state in the household around this time also impacts, try to be calm and jolly, if others are responding to the noise fearfully or if there has been stress and anxiety generally could add to the anxiety. What does fear look like ? A dogs trust survey found 72% of dogs were adversely affected with 10 % seriously impacted. What does canine fear and anxiety ( stress) look like? Learn to read what is usual for your dog. What is their normal behaviour or response to the environment, what is their default like? Learn to read body language . Do some research, there is so much available now about noise sensitivity. You cannot reinforce fear by offering appropriate support, If your dog seeks comfort give it, if they seek solitude enable it with your support . Make sure all health conditions are under control, both physical and emotional , pain can impact fear thresholds . Get a vet check , especially ears. Get the whole family and any friends and neighbours involved. Share the plan so everyone knows . Check up on local displays and note the times and days. Local FB groups can be helpful here. If you know local neighbours always have a party or use them on other winter occasions visit and explain if possible and ask for some warning so you can put your plan into action. Change your walk plan if you usually walk in the evening in the winter. Go during the daylight hours (before 16:00 ) or early morning. If this is not possible then miss walks for a few days around this time – don’t be caught out it could have a detrimental impact. If you have to go out use a double lead on collar and harness in case dogs slips out in their fear and flight. Do not let off lead at all. Make a list of games and enrichment ideas to play and gather the resources ready. Get a container with a LOT of treat sized food ready … no bigger than a little finger nail. Ideas: cheese, sausage, dried sprats, dried chicken, cooked chicken or other meat. Some fun Kikopup games, also look at some of her basics training, all positive and recommended . Canine enrichment FB group https://www.facebook.com/groups/canineenrichment is brilliant for easy to make and do games and activities. https://www.youtube.com/watch?v=pCRGevu2Eg0 through a dogs ear. Or your own calming choice .Learn some ttouch – this is a recommended free course . Consider a therapeutic option – remember there will be a range of what your dogs may respond to, what works for one will not for another, this is because their emotion is different in each case. Bach rescue remedy – very effective for most animals (including us) it is not necessary to have the more extensive dog version. It works with fear of both known and unknown origin and shock. make sure there is an exit. Do not use with children under 3 or pups under 6 months. Allow the dog to select the choices. Pet remedy – commercially available in vets and pets at home etc.- use as botanical advice above. Reiki can help to calm. Many practitioners work at a distance at this time. zyclene is often recommended by vets as is nutricalm. ask your vet for information. skullcap and valerian and st johns wort from Dorwest can also be useful, needing a loading time of several weeks. After a many requests and a good deal of successful voluntary electronic support across the UK and indeed globe I have decided to offer a virtual service. The Electronic Consultation can cover Training, Therapy or Integrated Training and Bach/Distance Reiki and Healing). Following an in depth written consultation from the Guardian, there will be a discussion around the issues raised. This can be done in a format chosen by the Client, including: email, Skype, Personal Message, WhatsApp or phone. The initial Consultation will take around and hour for planning and up to an hour discussion at an agreed time. Following this we will put a plan together to initiate the Training and or Therapy. There will be an open contact via email or PM throughout the following week where the client can share success and further challenge, including video and photos. There will be 3 following formal weekly checki-ns; at each the progress will be assessed and the plan modified as needed. There will be an option for booking further ongoing support. In some cases (within 1 hour drive of Taunton) it may be useful for a meet up in person. Travel expenses will be charged . This service is not suitable for deep behaviour issues and any that seem outside the remit of this service will be referred to a Behaviourist. Common training issues can be covered. Without the personal input , in line with the agreed plan, progress will be limited. Some needs can not be supported electronically in some cases,. Calm Dogs are Happy and Healthy Dogs – Something you dream of ? Being Calm is a much overlooked emotional state for our modern dogs. We have hurried lives ourselves often and this can impact upon them. They can have a quiet , but often not always calm , day and then everyone comes home, it is noisy or busy , anxieties of our day are shed in a cuppa or a glass of wine as we relax, we may walk the dog to relax ourselves and give them the exercise they need but are we engaging? Are we watching for THEIR needs on the walk? Often I see walkers on phones or for a 20 mins not engaging once with their dog. For an anxious or unsettled dog, or a dog with medical issues, being naturally calm is not their default. As for Puppies!! Well we all know what happens when they don’t get enough calm time. They become demanding, shouting, attention seeking and bitey. This can soon become a learned way, develop a behaviour to access attention or “feel better” and sometimes develop into a dog for whom THIS is a default. So What can we do ? How can we get this? Just a few images of how my dogs are encouraged to get some rest in between fun (and that is the key). I am privileged to be working with a range of colleagues to support dogs to gain this calmness. Currently I am working with the Absolute Dogs Team to become a ProTrainer. Their view is that Calm is essential. So how do we know if our dogs arousal (excitement, anxious) bucket is overflowing or close to doing so? What are the signs? Do you recognise any of these? 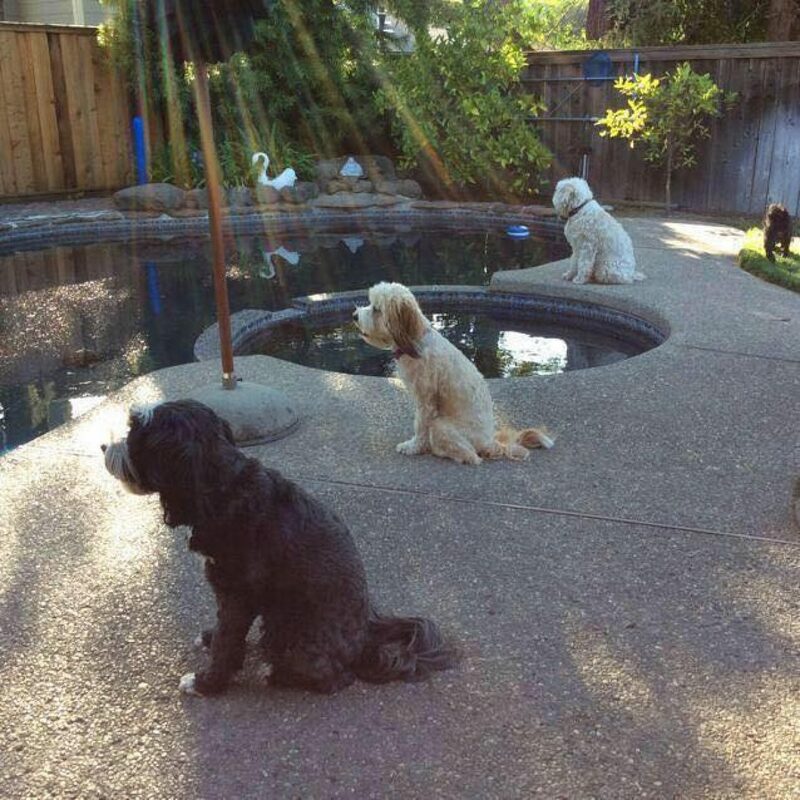 There are 3 types of calm according to the Absolute Dogs Team. Encouraging Calm (we call it “settle”) catch them genuinely settled and offer a little treat or a calm touch eventually adding a cue helps to get them settled in an environment they find arousing. I love to add music to this time, adding a sensory memory that can be invoked . This is a great way to help calm whilst you are absent or during the night or in another room. Our favourites are Islands by Ludovico Einaudi , The Essence Deva by Premal, The Music Within by Sat Darshan Singh, Anand Bliss Snatam Kaur. Creating a set of uninterrupted spaces – different specific rooms or beds creates a Calmness Protocol a default multisensory quiet place. Rest Perhaps the most important of the “Calmness Triad”. A crate, or bed, a safe place. No play here, no interruptions, a place to choose to sleep. Dogs need lots of sleep to process learning and the myriad of sensory inputs during their day. Children need to respect this place and we as adults can use this for the dog to take time away from children or busy homes. How do you create these calm places? Time out – rest , boundary games (see Absolute Dogs Ebook). Value the time in these places, short at first then extend until it becomes a choice, like Tilly above. Game on- Game off – have fun to tire the mind, managed arousal, fun, but use a start and stop cue… “1…2…3…GOOOO ” and finish with a calming stroke ” all done” . “Ditch the Bowl” use the majority or even all their dry food allowance (or an alternative for fresh fed dogs) for the games and activities, working for your fun is satisfying and tiring. Exercise and fitness – manange both the high arousal, fun and fast activities with the managed calm fitness Lola Loves the balance board or even an empty box ! What about the over-aroused, anxious or dog with reactive behaviours ? How else can we help? As an Animal Therapist and Integrated Trainer I see the signs above of over-arousal or reactivity most days either professionally or out an about. I often suggest trying one of a range of interventions wither commercially available or as one of my modalities. Bach Flower Therapies for dogs with historical trauma or a general anxiety or fear, these gentle therapeutic essences can be combined into a personalised recipe to enable the body and soul to work with the needs, I have seen amazing results , have a look on the FB page for Bailies story ...and Genghis below – you can see his peace. Reiki Especially combined with Bach and energy balancing can help manage the calm in over anxious dogs. Botanical Self Selection – also known as Zoopharmacognosy. This is very powerful to give the dog some choice about the herbs and aromatics they wish to choose for their specific needs. Every session I take part in is a joy to see and then the calm from the animal after is a joy to see. Look at Genghis just relaxing into Jasmine and Valerian. Crystal therapy –some dogs are amazing at being clear about the crystals they need and wearing them as an attachment to a banadana or cage attached to the collar can really help. I also work alongside Niki at the Norfolk Apothecary and her AniScentia range. The products are mostly Organic and all self sourced and she creates each product personally using her skills as a Master Herbalist and Aromologist/aromatherapist as well as many years experience as an Animal Therapist. I have tried all these anxiety and calming products with great success for my own and clients dogs. My Animal Matters – Rachel Windsor Knott Is also another brilliant source of not only Self Selection information but very high quality products. Aimed at both Therpaists and especially interested Pet owners her shop and website and FB pages are a great source of information.